Penicillin. Will cure any ailment. Maybe. For me, Milk & Honey is kinda like the music you listened to in high school: regardless of how much your everyday tastes may have changed or your repertoire has diversified, you’ll always have a soft spot for it and return to it often. It may be tough to say who reignited the speakeasy and mixology movements, but a case could probably be made for Sasha Petraske, Sam Ross, and the other folks associated with this SoHo watering hole. What began as a small, unassuming neighborhood place on an unlikely street near Chinatown is now a legend. Some things have changed over the years, but its primary appeal remains constant: it is a great spot for you and a few friends to enjoy truly amazing drink concoctions while actually being able to carry on a conversation without having to shout. If you only go to one New York speakeasy in your whole lifetime, make it this one. First and foremost, Milk & Honey is about great cocktails. Truly great cocktails. They utilize the finest alcohols, the freshest ingredients, and the memory and creativity of the bartender to offer some of the finest adult beverages you could ever drink. What they don’t have is a menu: you give the server some kind of general direction (e.g. “I want a gin-based drink,” “I want something like a grasshopper, but with a hint of orange,” or “I’m in a surly mood — give me something appropriate”), and they bring you back something yummy. I’ve never had anything that wasn’t easy to drink, and many things were downright brilliant. One other thing they don’t have is vodka: when friends have unwittingly asked for a vodka-based drink, they were politely informed that vodka isn’t used in traditional cocktails and therefore they don’t carry it. Others have simply been told, “We don’t have any” without an explanation. It is the only whiff of attitude I’ve ever experienced. This is the kind of cocktail you just cannot get at most places. Who’s going to have fresh made ginger-honey syrup just laying around? All the drinks are $16. This may sound a bit high, but considering that it costs about this much to get a gin and tonic at a W Hotel anywhere in the country, it actually is quite reasonable. The more difficult thing is that they do NOT accept credit cards; if you’re short on cash, you have to go to the Delancey Street pizza joint around the corner and use their ATM. Soon after, the popularity of the place and its drinks soared. Next thing you know, people from far and wide came to visit this neighborhood watering hole. To combat the crowds, they instituted a reservation policy and tied it to a phone number that they didn’t publish and didn’t want widely known. If/when the number appeared online, in some print publication, or was otherwise too widely disseminated, it was changed. Quickly. 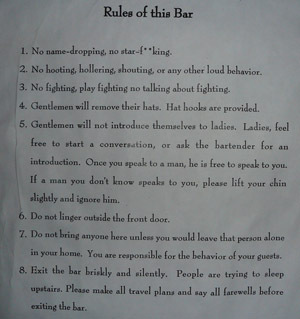 To help the newbies conduct themselves appropriately, Mr. Petraske published the now legendary Rules of this Bar. They emphasize behavior that is polite, traditional, and subdued — in sharp contrast to the party atmosphere encouraged at most other places. Though the most quoted is Rule #1, my personal favorite is Rule #4: “Gentlemen will remove their hats. Hat hooks are provided.” Milk & Honey came of age when trucker hats were tragically high fashion, though with fedoras having taken over as headgear of choice, the requirement is as relevant as ever and gives both an extra bit of class and a retro-authenticity to the place. In 2008, Mr. Petraske announced that he was turning Milk & Honey into a private club, similar to its London namesake. Membership would start at $300/year. At some point, this was abandoned and it once again became a bar opened to the public. The reservation system returned; it remains largely unpublicized, but its secrecy is not guarded with the same verve that it used to be; some judicious Google searching should reveal the details easily enough. One final thing . . . if you do want to go, you should do it soon: word from Time Out NY is that Mr. Petraske will be moving Milk & Honey uptown in the not-too-distant future, with Mr. Ross taking over the 134 Eldridge Street location and converting it to a slightly different cocktail bar concept to be called “Attaboy.” No news yet on where the new Milk & Honey will be located or what the vibe will be. Tags: cocktails, Milk & Honey, penicillin, speakeasy. Bookmark the permalink.